This is my first bike with a hydraulic clutch and it's harder to press than anything I've ever ridden. At first I don't notice it, but after 20 min of stop and go traffic my left forearem is more tired than after a full 1h arms workout. Keep in mind that I'm strong enough to fully compress a 200lbs hand gripper on a good day! Other people (GF for one) can't even fully compress the lever once with one hand. This can't be right! I've bough some steel braided lines and when I'll swap the clutch one I'll try to open up the master and slave, hopefully it's only dirt in the pistons and/or old fluid (previous owner claims to have changed it 3y ago), however perhaps you can give me some input if anything in particular is needed. 1-How heavy should the clutch lever be? 2-Is bleeding any different to brake bleeding? Do yourself a favor and buy a clutch master rebuild kit and buy the parts to do the slave. I can almost guarantee they both need it if not done recently. 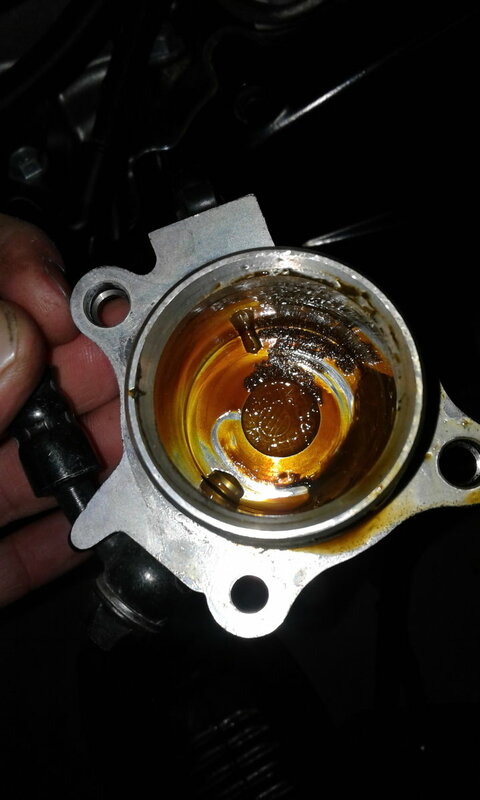 Here pic of what mine looked like, and I'm a stickler for routine maint. I'm guessing the fresh seals in the master will alleviate your heavy pull. It shouldn't be a difficult as you describe. Here's a pic from a CBR1k I did at work. This wasn't mine but if you suction the fluid out and remove your cup and see this, you know the entire system needs rehab. I hoped I'd do with only a quick toothbrush scrub with IP alcohol, but at least I didn't find out I needed to get the parts AFTER taking it all apart. What it that stuff inside the slave? Rust or only sludge? And if rust, can it be just buffed off? 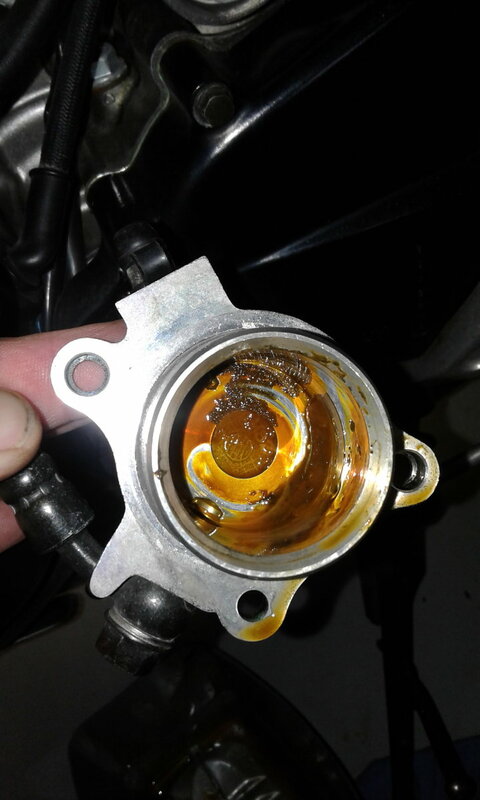 The slave was tampered with as there is a trace of liquid gasket (as they likely reused the OEM one), but that is before the last owner got the bike (1st owner '03-14, 2nd '14-18, now me). 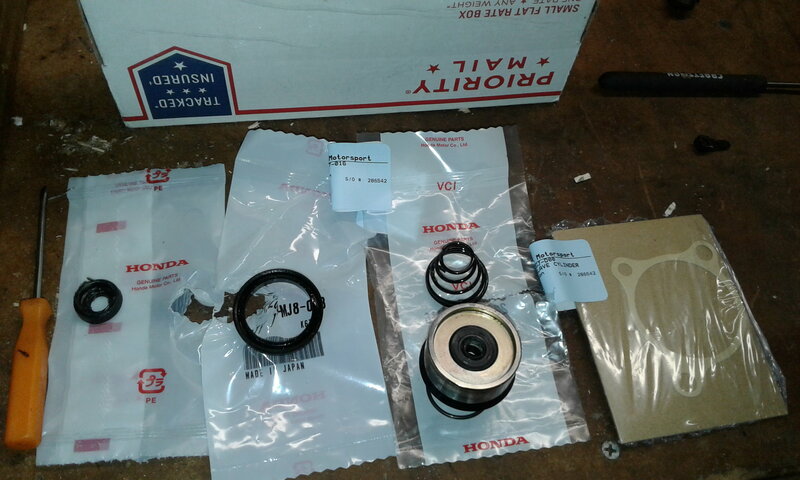 Also, is there any decent manufacturer for the rebuild parts? OEM might take too long, and I couldn't even find the slave parts listed on partzilla. Do yourself a favor and buy a clutch master rebuild kit and buy the parts to do the slave. I can almost guarantee they both need it if not done recently.. YES, the Hydraulic system on the VTR gets overlooked until it no longer works right, and Every One that I have repaired or I've had a hand in helping repair looked like the pics above give or take..
Buy the full list of parts needed...don't forget the cleaners and assembly fluid or grease and rebuild both master cylinder and slave cylinder. If you don't have a set of long nose snap ring pliers, buy a pair of the less expensive ones at least...the time, effort and frustration it will save you in working on the master cylinder is worth the few $$ to buy them, even if you give them away after. Thanks Marquez for the tips! Is the slave cylinder needed as well? If you're buying master cylinder rebuild kits, I like the All *****. I've used a ton of these (bike mech by day) with great success. I prefer the oem parts on the slave. I'm not even sure there is an aftermarket option. Mine is hard as well. I never really gave it another thought because ive only rode 3 bikes ever and all were older. Rear brake is very hard as well. Time to dig into that also. @Floyd- mine was also very hard and impossible to bleed. Some thorough cleaning + some red brake rubber grease cured the issue. Coming back to the clutch rebuild parts: I've found from K&L Supply 32-1081 and 32-0156 (rebuild kits for the master and slave, made in Japan). Any opinions on those? Both amazon and ebay review show good feedback, and I'd get both for ~45USD + shipping. All ***** was my first intention- so far they've been decent quality for decent prices- but they don't make any rebuild kits for this. I've even tried searching for vtr750 and cbr1000f as those seem to use the same clutch master/slave but all ***** lists nothing for those as well. K&L is very good quality as well. If I don't use All *****, it's K&L kits. SKF green stripe fork seals being an exception. I use a K&L carb and petcock kits every month to keep our fleet going...... But on my bikes and good customers, all rubber stuff when available is OEM. OEM from partzilla costs ~110$ and K&L is ~50$, prices incl shipping, on top of that I'll have to pay 19% VAT and 2-3% import taxes. Ordering locally will get me to the same after tax prices +15-40% extra. If the K&L lasts 30% less, it'd still be much better value . Last edited by E.Marquez; 06-15-2018 at 10:43 AM. Okay, so seeing those pictures Wolverine posted of the schmutz in the clutch system, this has become the next thing I will be servicing on the used bike I bought a few weeks ago. And yes, feathering the clutch while creeping forward in traffic becomes a hell of a workout. I assume there's gunk in the lines too, how difficult is it to clean that out? Do you just flush with fresh fluid, or try to run some air through them, or what? 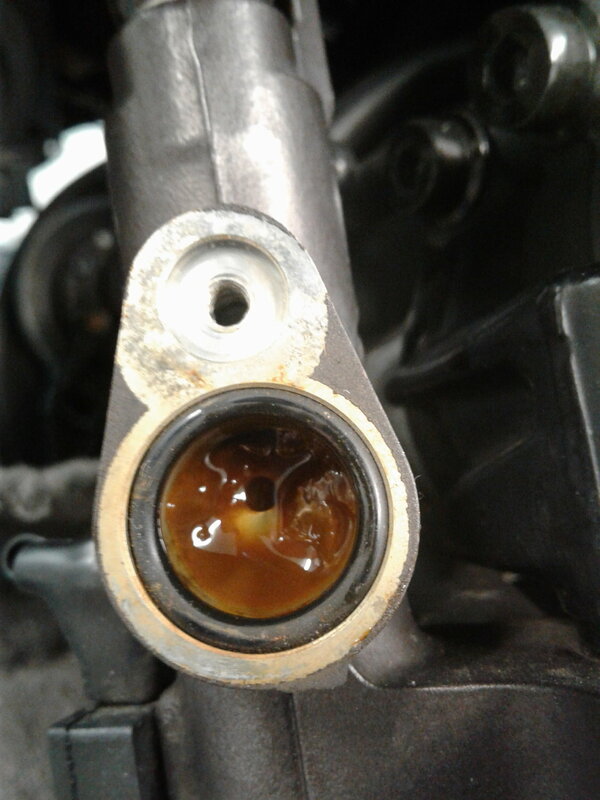 I have never found anything but contaminated fluid in the lines..so if your fluid in the Master cylinder has floaties, sure, it will be in the line as well..but draining, then filling and bleeding takes care of that. Last edited by E.Marquez; 06-20-2018 at 12:05 PM. I have never found anything but contaminated fluid in the lines..so if your fluid in the Master cylinder has floaties, sure, it will be in the line as well..but draining, then filling and pleading takes care of that. Thanks. 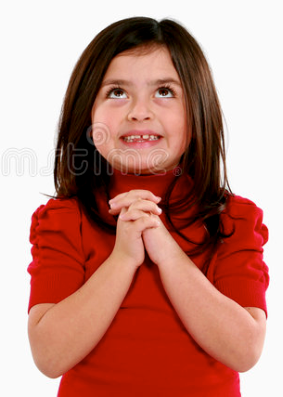 And hopefully pleading won't be necessary. The K&L kits arrived to rebuild the clutch master and slave cylinders, they were both cruddy (not as bad as the ones in Wolverine's pictures, but overdue for attention). The installation was a nice straightforward job, bleeding the system was easy, pleading was not required, and the effort to squeeze the clutch lever has definitely reduced to something wouldn't **** off David Banner. Clutch - do you have to drain the coolant to remove the clutch cover? Clutch jump starting possible with slipper clutch? Different wiring diagrams for 1998 year.